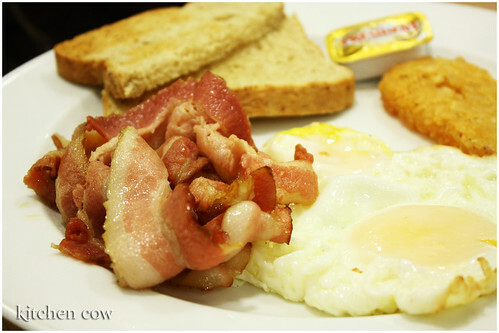 My love for UCC is something I don’t keep secret, so it’s easy to understand why I was so excited when I was invited to a sponsored breakfast with other bloggers. Truth is, UCC is not a coffee shop I visit on a whim. The notion that it’s expensive is not unfounded because it is a bit pricier than other coffee shops. Still, I love UCC because it’s every peso well-spent. 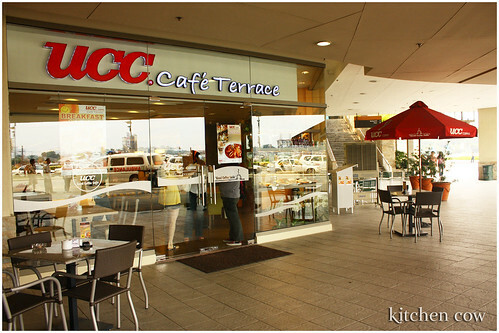 UCC, which stands for Ueshima Coffee Company, is a Japanese chain that takes its coffee seriously. For one, they have a hand in all stages of the coffee production, from conditioning the soil where the coffee is to be planted to choosing which side to serve your coffee from (the left side because a lot of their smoking customers keep their cigarettes on the right). Devotion to the perfection of their coffee is utmost. They even employ classificadores, expert coffee tasters who decide what blend to use for their coffee from year to year, all to ensure consistency in their blends to compensate for the differences of each year’s coffee crop. Trying out their different coffees was a pleasure. From the smooth house blend, to the strong, aromatic sumiyaki (always my personal favorite!) to the prized blue mountain which had nuances of acidity without being unpleasantly sour. 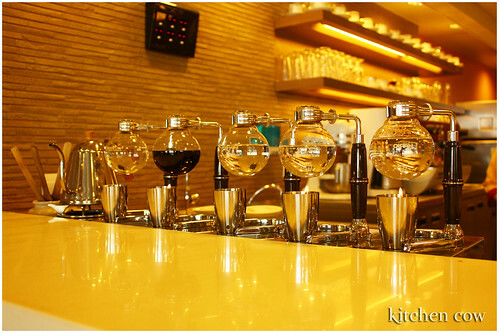 Their coffee, siphon brewed as you order (remember my fascination with that weird coffee brewer thingie a while back? 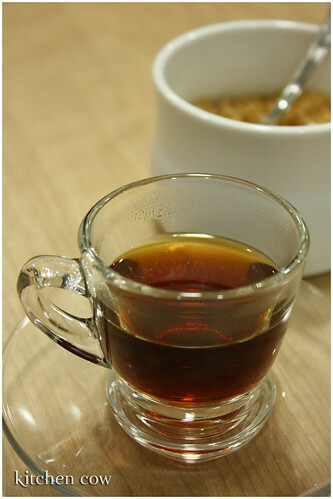 ), is so wonderfully prepared that I found it more enjoyable to sip it sans cream and sugar. Of course, while the excellent coffee is a good enough reason to visit UCC, for me, the real reason to go to UCC is always the food. From their hearty breakfast fare, to their mouthwatering fusion Japanese dishes to the toothsome desserts, there’s much to sink your teeth into. We were told to choose something from the breakfast menu. In a way, it’s a good thing because otherwise, I would’ve ended up with Chicken and Mushroom Risotto again. I had the Frankfurter Waffle set. Piled on my plate was a thick, juicy, flavorful frankfurter that was adorned with little cross-hatches. (I can already see it in my bento. 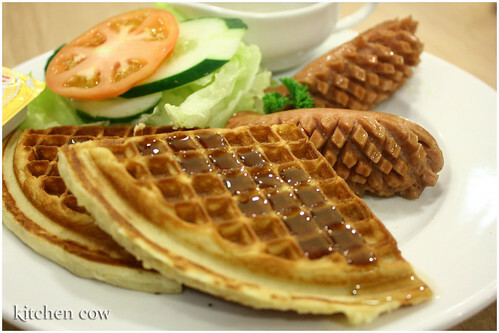 :P) Served with it were two light and crisp waffles and a small fresh salad of lettuce, tomatoes and cucumbers. On the side was a small gravy boat of syrup. 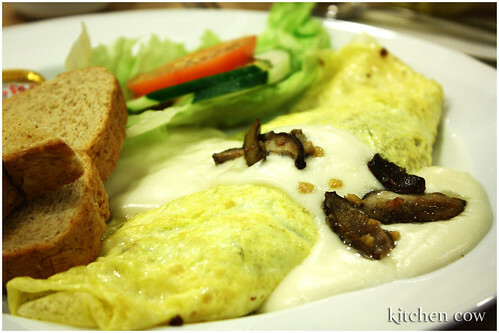 While I enjoyed my food, I have to confess, I was so envious as I saw Rochelle’s Shiitake Mushroom Omelet being served. An omelet folded with mozzarella cheese and lightly sautÃ©ed shiitake mushrooms then drizzled with a sauce that I assume to be a variation of bÃ©chamel, it was delicious. Plain and simple delicious. The shiitake was earthy, perfectly complemented by the light cheese and creamy sauce. I wanted to switch our plates when she wasn’t looking but she took pity and shared her food. 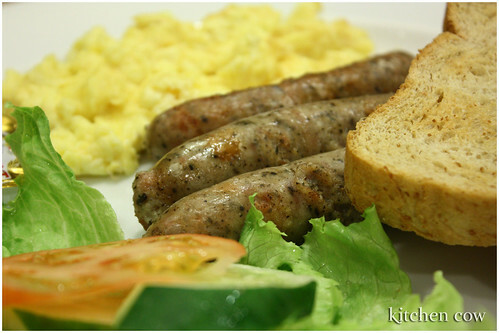 And here’s Marck’s English Bangers and toast. 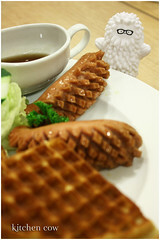 The sausage with the waffle cuts remind me of pine cones! I have to learn how to do that…shoot pics before I eat. i have the same problem of eating first then remember that i need to shoot the food…like…after i’ve eaten everything. XD E di wag na mag-picture! Kain na lang ng kain, hehehe! What camera do you use? You take lovely pictures. UCC has a special place in my heart, because I one of the first interviews I did as a writer was with its owner. We talked about their high-tech, PDA-enabled ordering system. Their branches are so far though, so I haven’t been there in ages. This post made me went to go again. The food looks scrumptious! I’m hungry now. Usually outside the coffee shops but this particular one had a glassed in smoking area. That’s a rarity though, it’s mostly al fresco. I guess it helps that we’re in the tropics. And yay for pinecones! Actually, it reminded me more of treeson! Awww, that’s disappointing. But maybe it simply means you’ll have to make good coffee for yourself? Kung kaya ko, kaya mo! Actually, it’s just a matter of getting used to it. Now, even my mom’s used to letting me take photos before digging in. Thanks Mrs.G! Heehee, that makes me happy—that’s one field where I really want to improve. To answer your question, I switch between two cameras, a compact point and shoot (IXUS55) which resides permanently in my purse, and a larger DSLR (EOS450D) for when I’m feeling artsy. I’m still getting to know the DSLR (Natsuki! Yes, I name my gadgets) more though, as she’s only been with me since the end of April. For this particular entry, I was using the DSLR. What a way to start the day! I think I’ll get that mushroom omelet sometime… and that kitkat mousse too!!!! It was nice to see you again! Its been a year now isn’t it. Keep blogging! Cheers! It was light and yummy, really a perfect way to start the day. I really regretted not getting it instead. My food was good too, but it’s not something I can only get at UCC. Unlike the omelet. Inggit ako sobra nun, heeheehee. the management is not good…the staff dont take the benefits equally..